The importance of this move cannot be overstated. At a time when the plan calls for an accelerated schedule of handing over security functions to Afghan military and police, NATO is now admitting that relations with them are so bad that no NATO personnel can be present inside the very ministries with which they need to work. The United States should resist the urge to pull troops out of Afghanistan ahead of schedule due to the violence against Americans over the burning of the Koran at a U.S. military base, U.S. Ambassador to Afghanistan Ryan Crocker said on Sunday. “This is not the time to decide that we are done here. We have got to redouble our efforts. We’ve got to create a situation that al Qaeda is not coming back,” Crocker said. When even “diplomats” refuse to understand the underlying cause of violence in the current situation, it’s hard to see how it will be defused. 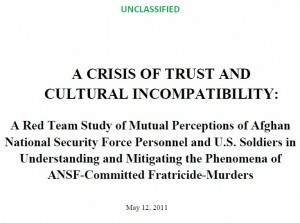 An extreme clash of cultural values has been shown to underlie the tensions between NATO and Afghan personnel, but the response to having this pointed out has been to attempt to bury the report by retroactively classifying it and to declare that we need only to “get on with business” to complete the failed mission in Afghanistan. In the latest sign of how strained U.S. and Afghan military relations have become, a senior U.S. official tells CNN, “There is a strong sense inside the Obama administration that the Afghans did not do enough to quell the violence” that has erupted since the burning Qurans and other religious material a week ago. Yup, these are just spontaneous demonstrations and there is no reason to look at underlying reasons for why Afghan personnel would attack NATO personnel. After all, that report has been classified, so we shouldn’t mention it.